Last night another episode of Season 2 of Cedar Cove aired on Hallmark Channel. I still remember the feeling I had when I first saw a commercial for the show last year. It was a show pitching the basic concept, without any real detail of character or plot, so much as it pitched, the town of Cedar Cove, and what an idyllic summer getaway Hallmark Channel would be offering. I remember watching Andie MacDowell riding her bike around this small coastal town, and being reminded of the Cabot Cove episodes of Murder She Wrote. As Andie MacDowell waved at friends and greeted neighbors I was reminded of some of my favorite Angela Lansbury scenes, and I immediately wanted to tune in and find out what this show was about. As more commercials aired, and I saw familiar faces Dylan Neal and Teryl Rothery filling in the cast, I grew more interested. Then I tuned in to the episodes and was charmed by this small wholesome town with some genuine people and characters. Episodes where a judge discouraged a quick divorce in favor of counseling and making certain a young couple was not taking an easy out when a marriage could possible be worked on and a love saved. A divorce where instead of the children spending a week here and a week there, the children stayed in the house and it was the parents who alternated weeks in the house! What a fascinating concept. Barbara Niven and Bruce Boxleitner may be one of the most delightful couples currently on tv, rivaling White Collar’s Tim DeKay and Tiffani Thiessen as the Burkes. Seeing a portrayal of a couple who not only cares about one another, but as clearly hit rough patches over the years, faced problems together and come out stronger is both an inspiration and a role model for those of us who know how easy it can be to give up, seeing proof that the work is worth it is reassuring, even if we know the couple is a fictional reminder of so many strong couples in our own lives that somehow get overlooked because they are outnumbered, or seemingly so, by the high divorce rate. 16 Lighthouse Road was a joy to read. I could almost hear the actors reading the lines the characters had so smoothly translated from the book to the screen, though many details of backstory had changed. In quite a few cases people seem to be younger on the screen, Justine‘s occupation/career path feels entirely different little things of that nature. And in the book I missed Moon and his coffee shop, perhaps he appears in later books, if he is a creation of a show, then I give them kudos for a wonderful addition, and one that so perfectly fits with the town of Cedar Cove. So I talked to Debbie Macomber and one of the things she said is that when she writes her books, she doesn’t really write descriptions of the characters, but in her head she has a lot of backstory so have you talked to her about your character’s backstory? I purposely don’t read the books. This is my second book adaptation TV series and my approach is my boss is the showrunner, not the author. The showrunner’s job is to interpret the books to what we’re going to do. It may be exactly the same; it may be completely different. My job is to do what the showrunner wants. I don’t want to cloud my vision with what the author did. I was reminded of that exchange as I read the book and noticed subtle changes to the drama, little things that in the proverbial sense perked up my ears and made me stop and think. I wondered “why change this?” “Was that something that worked better on the page than the screen?” “Would this have played as well on screen, or taken too long?” It intrigued me to think back to his comments and realize how confusing it might have been as an actor to go into a project thinking you had a full understanding of your character, only to have the writers, unintentionally, pull the carpet out from under you as they start changing details. Think back to my comment above about Justine, in the book she is a highly organized number cruncher. On the show I adore the character Justine, but feel she is more of a mid-twenties woman still trying to feel out where her true occupational passion lies. On the screen I do not consider her a career woman who has worked a path and achieved a goal, yet in the book I did feel that way about her. In both cases I liked her, respected her, and enjoyed her journey… but there were times when I felt like I was witnessing two sides of the same coin. There was a point in that character’s evolution where she could have gone left or right, for the screen she went one direction, for the page the other. Each was fascinating, and enjoyable, but he results were different in that aspect of her life. As I reached the last page of 16 Lighthouse Road I was disappointed. I did not want my visit to Cedar Cove to end! Thankfully, I had bought that 4 book bundle, and as I clicked to what would have usually been an about the author page I instead turned to the first page of 204 Rosewood Lane, and before I knew it I had read 4 chapters into Grace’s book. Teryl Rothery (as Grace Sherman) and Sebastian Spence (as Cliff Harding) have been amusing me endlessly since they first appeared on screen. I simply can not wait to sit down and read more of their story, and in this case I was thrilled Cliff had not been created for the television show — it means I have pages and pages ahead of me in which to enjoy their fun exchanges. And I adore the banter between Jack Griffin (aka Jack Griffith, played by Dylan Neal) and Judge Olivia Lockhart (Andie MacDowell). Those two are a delight to watch on the screen, and their characters are an equal joy in the book. If an hour a week in Cedar Cove is not enough. If you have already watched every episode (Season 1 is out on DVD for those who did not see it when it aired on Hallmark Channel last summer). Remember Debbie Macomber started this all with novels that contain the charm and essence which fills these episodes. Members on this cast have an incredible resume, please take the time to check each of them out on IMDB, it was impossible to pick one credit to put beside any one of them. With actors from Four Weddings and a Funeral, Dawson’s Creek, Arrow, Stargate SG-1, First Wave, Scarecrow and Mrs. King, Babylon 5, Confessions of a Dangerous Mind, Strong Medicine… and that just scratches the surface of what a few of these talented folks have been a part of, so if you feel like some of those names and/or faces rang a bell, there is probably a reason. Take a moment to click over to the Internet Movie DataBase and jog your memory. 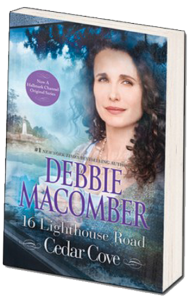 This entry was posted in Novel, Review, Television and tagged 16 Lighthouse Road, 204 Rosewood Lane, 311 Pelican Court, 44 Cranberry Point, Andie MacDowell, Arrow, Barbara Niven, Bruce Boxleitner, Cedar Cove, Cedar Cove Series, Debbie Macomber, Debbie Macomber's Cedar Cove, Dylan Neal, Hallmark Channel, PopArtsPlace, Sebastian Spence, Teryl Rothery, Tiffani Thiessen, Tim DeKay, White Collar on September 7, 2014 by A Novel Approach.